Following the huge success of this year’s HEAT GeeStor Productions and Island Flavours team up with 3ness once again to present HEAT the Ultimate party getaway in 2019. 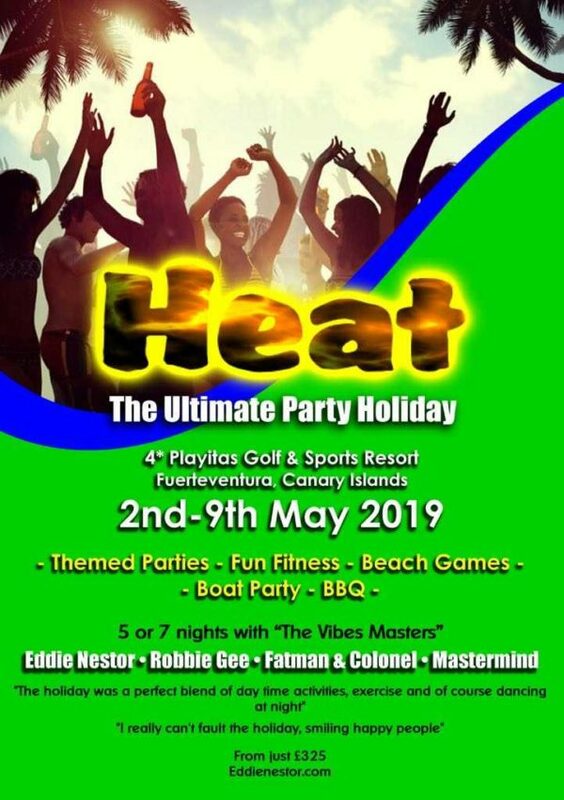 HEAT takes place on the beautiful island of Fuerteventura in the Canary Islands, 2nd to 9th May 2019, at the fabulous 4* Playitas Golf and Sports Resort to provide you with a holiday break like no other! Join Eddie Nestor & Robbie Gee, Fatman & Colonel and The Legendary Mastermind turn up the HEAT for a party in paradise! Your stay will be filled with Pulsating Parties, Brilliant BBQ’s, Fantastic Fitness and that’s not all. There will also be games, competitions, a variety show, boat trip and of course plenty of sunshine. Come and relax with professional like minded people, who know how to party. This wonderful getaway is going be hot, hot, HOT!